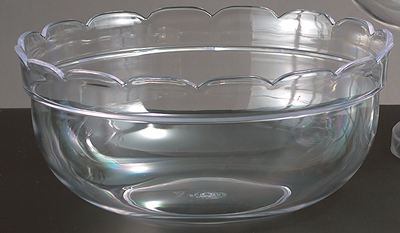 Dress Up your table with this Scalloped Edge Bowl. Makes a Beautiful Mixed Fruit Salad Bowl. Also good for any Vegetable you would like to serve. Maybe a Large Bowl of Banana Pudding, Chocolate or Vanilla Pudding, just use your imagination!! The Assorted Colors will really dress up you table. (W) 9 3/8" x (H) 4 1/8"